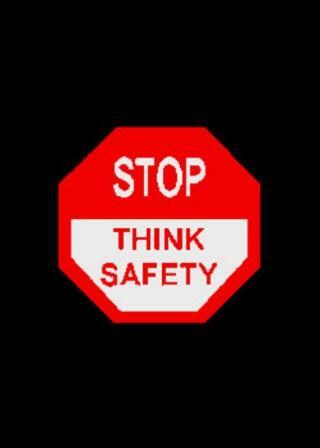 Stop Think Safety 24oz. Nylon safety message entrance floor mats imprinted with a bold red and white message; Stop Think Safety. Each Stop Think Safety floor mat is available in either size of 3' x 5' or a larger 4' x 6' and each one has a 70 mil thick black PVC backing and a 5/8" black border. All made in the U.S.A. Part of the OptiMA Inc. safety series of products. NT-194-STS-305 3' x 5' Stop Think Safety UPS 8 lbs. 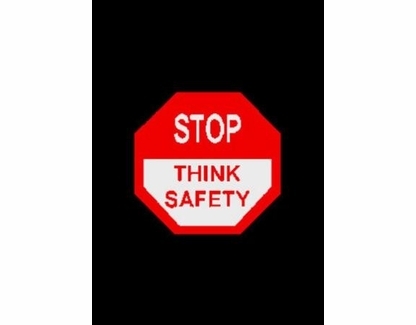 NT-194-STS-406 4' x 6' Stop Think Safety UPS 12 lbs. Color: Black Mat with Bright Red and White Print.